The aromatic and chemical constituents of Birch and Wintergreen are extremely similar, though they are completely unrelated plants. Both have been used in teas and for flavoring `root beer'. The chemical constituent salicylate (89%) is the natural version of common aspirin (salicylic acid). Elevates opens and increases awareness in sensory system. 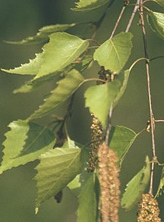 Do not use Birch if you are allergic to methyl salicylate. May be contraindicative for epilepsy. Acute over-dose for 150 lb. person may occur at roughly an application of 1.5 tsp or approximately 80 drops.